My problem is that no static IP is getting assigned to the built-in ethernet port. I have run netplan apply several times. I've also rebooted the PC and still no luck. 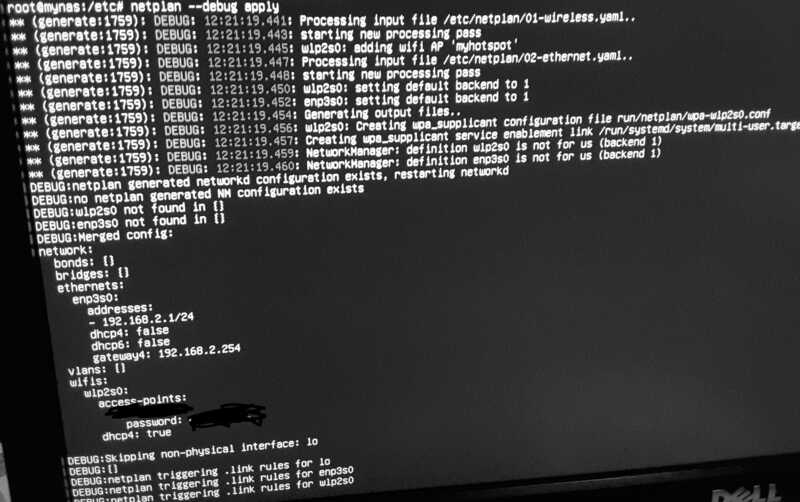 If I set the ethernet port to use dchp4:true and connect an ethernet cable from it to my modem/router and disable my WiFi card (by removing the netplan config), the PC can connect to the net without any issues. This is the output of netplan --debug apply which also shows the contents of my YAML files. I have tried with and without dhcp4/dchp6/gateway4/renderer. I had sucess with interfaces file, like previous version. With following static ip config like eth0 in the following example. Is network-manager defined as renderer ?.. Disable networkd and run netplan to see if it is applying the config. Not the answer you're looking for? Browse other questions tagged networking netplan or ask your own question.